The number of Internet users in Indonesia has increased since the technology was introduced in the 1980s. 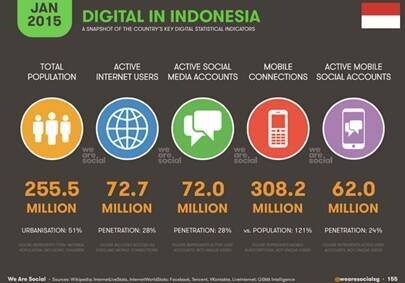 A study released by “We Are Social” reported that by the end of 2014, the number of active internet users in Indonesia had reached 72.7 million or approximately 28% of 255.5 million of total population. Google estimated that over 74% (+52 million) of Indonesian Internet users were more frequently accessing the Internet through mobile devices, such as smartphones, tablets and laptops. The number was even projected to increase twice by 2018, which will translate to over 100 million Indonesia access the Internet using mobile devices, particularly smartphone. 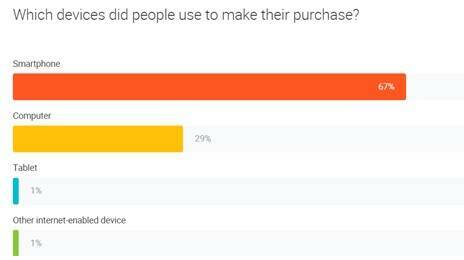 The strong smartphone penetration has given opportunities for e-Commerce players, as according to a Google’s survey in January to March 2015 involving around 1,200 respondents, it was known that some 67% of the sample use their smartphone to make purchases online. It is an m-Commerce applications which uses classified/ad listing business model. This kind of model is suitable to be run in developing countries as the store manager did not have to facilitate online transactions, while the Cash on Delivery (COD) method was commonly done in its transactions. Until May 2014, the Indonesian public recognizes it as “Tokobagus” before the company’s decided to re-brand their product into OLX Indonesia, which was adopted from Nasper’s global e-Commerce brand. The similar ad listing e-Commerce, called “Berniaga.com” later joined OLX in the same year. OLX Indonesia steadily placed itself as the most searched and most downloaded e-Commerce brand with 66,147,350 searches in the past 1 year period and more than 10 million downloads recorded. The apps also received highest positive feedbacks with 61.26% of its user gave a 5 stars review on Google Playstore. No wonder that Frontier Consulting congratulated OLX with Top Brand Awards in online shopping category for three consecutive years in 2012, 2013 and 2014. Owned by a Germany’s giant startup Rocket Internet, Lazada may become the largest Business to Consumer (B2C) e-Commerce application. In the end of 2013, a group of investors, e.g. Tesco PLC, Access Industries, Investment AB Kinnevik, and Verlinvest have disbursed USD250 million to fund Lazada expand its business. 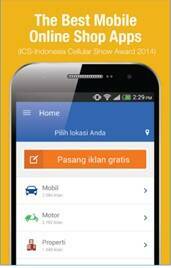 Since the release of the mobile and application version of its website in Android’s Play Store (June 2013) and Apple’s AppStore (January 2014), Lazada has been downloaded for over 11 million times by users in Indonesia, Malaysia, the Philippines, Singapore, Thailand, and Vietnam and was awarded as the Best Online Shop App Indonesia Cellular Award in 2015. 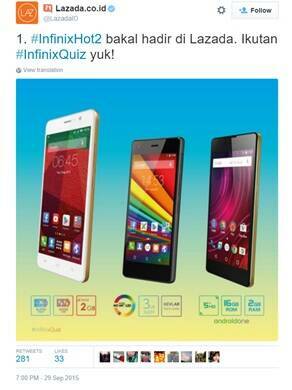 In the last six month, one of Lazada promo which really helpful to boost the mentions from twitter was a contest involving netizen to win an Infinix Hot 2 smartphone using #InfinixQuiz with a total of 42,776 mentions. Started the e-Commerce business in 2009, at the age of six, Tokopedia has become popular virtual stalls for more than 10,000s of merchants and sent at least 2 million products per month to all buyers. 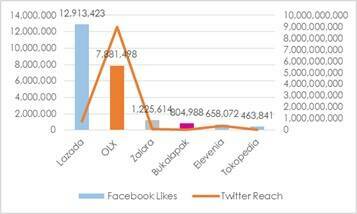 Additionally, #tokopedia was the top hashtag among other e-Commerce brands used in their Twitter handler. 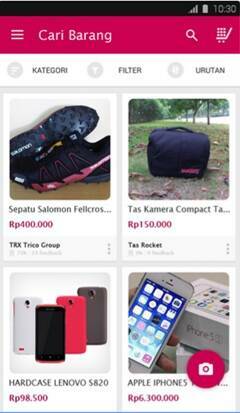 Tokopedia launched its mobile application for android in June 2014, followed by the iOS version a year afterwards. The marketplace has also attracted Japanese conglomerate, Softbank Internet and Media Inc., and Sequoia Capital to provide financial support worth around USD 100 million in the development of its business in October 2014. The online marketplace which carried out the Customer to Customer (C2C) concept was first established in 2010 by a Jakarta-based digital agency, Suitmedia. Bukalapak provides diverse options in terms of payments, ranging from inter-bank transfer, online payment, to credit cards using. It also provided a joint account facilities to ensure the safety of its users, by accommodating the buyer’s money before being handed over to the seller, unless the buyer has received the ordered goods. Bubu Awards v.09 named Bukalapak the best e-Commerce website in early October 2015. Thanks to 804,988 facebook fans and 60.19% 5 stars review on Google Play Store who made the e-Commerce firm to be quite attractive that a personal computer services provider, Emtek Group considered to give its investment to support its vision becoming one of the big players of e-Commerce business in Indonesia. Focusing its business on fashion e-Commerce, Zalora is a part of the Global Fashion Group, which has AB Kinnevik and Rocket Internet as the primary investors. Established in 2012 in Singapore, Zalora which has released its mobile application in April 2013 (iOS) and July 2013 (Android) has expanded its business to other Southeast Asian countries, including Indonesia. Until the end of 2014, around 52.8% of its traffic come from mobile devices, and tablets. 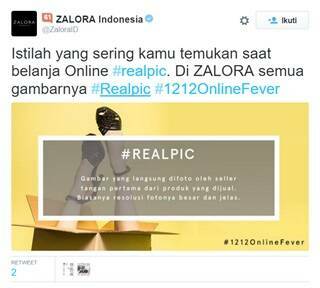 One of its powerful social media campaign of Zalora was using #realpic to define that all photos posted in the marketplace was directly taken by its seller. The campaign grabbed attentions from netizens which posted a total of 16,093 mentions during May to October 2015. Among those being mentioned earlier, Elevenia was still a rookie in the business. 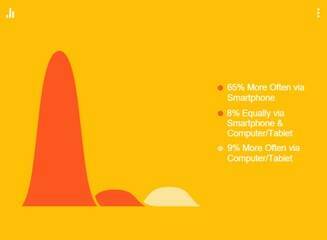 Nonetheless, it claimed that 60% of the total traffic and 30% of the total purchase come from mobile devices. 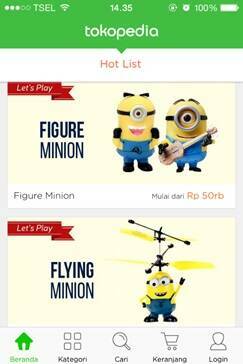 Founded by a joint venture of online service providers XL Axiata and South Korea’s SK Planet in March 2014, Elevenia presented as a marketplace application that provided tons of attractive promotions with various downloadable discount vouchers for its visitors. With more than 800,000 of active monthly shoppers, the e-commerce was quite confident that it enjoys a customer satisfaction of 80%. Tokopedia’s Special promo Ramadhan Surprise in July 2015. Elevenia reached its top searched in July 2015, when it held “Special Promo 2015″ campaign. Customers were offered with a discount of up to 90% for various products, including housewares, snacks, and fashion during Ramadhan and Eid Al Fitri. Go through our social media analytics services to get a similar survey done for you.